Joining history, mythology, symbolism, and landscape architecture in a fun a relax way, this tour specially dedicated for kids provide the best introduction to an illustrious time of the French history. Your Licensed English-Speaking Guide will pick you up from your hotel in Paris at 8.15am in a luxury private vehicle. On the way to Versailles, he will give you a complete introduction to the century of Louis XIV, and the history of the Palace of Versailles, one of the jewels of French architecture. It took around 50 years to build the largest royal residence of the world between 1661 and 1710. Only 12 miles southwest of Paris (approximately a 30 minute drive), you will begin your day with a private visit of the palace of Versailles, specially adapted for kids, with mysterious stories and funny legends. Your licensed guide will have the reservation he has bought prior to your visit, so you will not have to wait in the long queues ! (He will enter with you through a special entrance to start the visit). Your expert guide will incorporate interactive activities in his tour to foster learning in a fun and engaging way. After visiting the castle, your guide will take you for a stroll through the gardens. During high season weekends (from April to October) you will be able to enjoy a magnificent show accompanied by music : Les Grandes Eaux Musicales. The kids will love this !!! 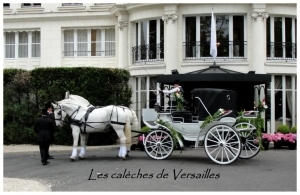 After this delicious lunch, a private carriage ride, will pick you up and will take you for an unforgettable moment. 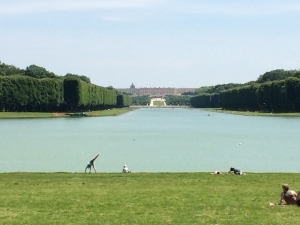 This is certainly a wonderful way to experience the beauty of Versailles. Sit back and relax in a stylish coach while you discover the main monuments of the city on a horse and carriage ride with your family. 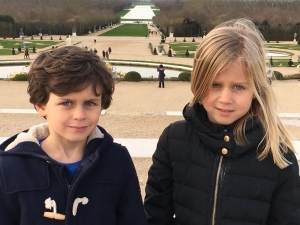 Following this, it is now time to introduce your children to the secrets and wonders of the Versailles Gardens. After that, your guide will invite you of a stroll in the beautiful gardens à la Française designed by the famous royal gardener, André Le Notre. 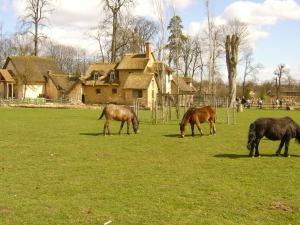 Enjoy a last walk to the Queen Marie-Antoinette’s Hamlet : the best place ever with kids ! It depicts a small Normandy-style village where Marie‐Antoinette would play the country girl and escape the pressures of court etiquette. If you’re traveling with small children, the farm has lots of great activities for kids as well. You will stroll through the grounds of the hamlet, smell all the fresh flowers, sit in the shade under the trees, feed bits of baguette to the fish in the pond… It is an idyllic setting for a last country stroll before heading back to Paris in the late afternoon where you will be dropped off at your hotel around 4.30pm. The grounds are littered with quaint little structures resembling the type you might see in any tiny French town – a chapel, a mill, a dairy, a chicken coop, a water wheel, etc. The grounds themselves are also beautifully maintained, and each structure has its own garden filled with flowers as well as fruit and vegetable plants. The grounds include a large working farm, which initially produced the fruits, vegetables, and dairy that were consumed by Louis and Marie themselves at the royal dinner table. The only sign that this miniature city once belonged to a queen is on the inside (which, unfortunately, is only visible by peeking in the windows), where you can spot Italian marble floors, intricate mouldings, and gold hardware fixtures. A few scenes in Sophia Coppola’s movie Marie Antoinette were filmed on location here, and they do a great job of giving you a glimpse into how peaceful and relaxing this little getaway was for the Queen. The hamlet was a perfect place for her to enjoy a more simple life while still retaining all of her royal luxuries and protections. The tour will be also based on legends & stories of the versailles history for the children, and depending on their ages, we will then arrange a game as well. Optional If you wish you can view the training of the horses at the royal stables of the castle. Please note that for parents, French adventures has access to the private cabinet & appartment of Marie antoinette, and LOUIS XV a VIP TOUR not accessible to public. This part of the castle of Versailles is usually closed to public, this tour is under request only.